(4-LP + Poster + Booklet) This deluxe vinyl box set salutes famed pianist Guaraldi, who, in addition to gold records and global acclaim as a renowned jazz artist, will always be best known for his cheerful, uplifting work with Charlie Brown and the Peanuts gang. 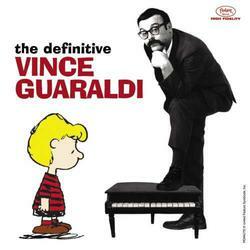 The collection spotlights 31 tracks recorded by Guaraldi between 1955 and 1966, presented on four 180-gram vinyl LPs. Also included is a collectible 12" x 24" poster of Guaraldi; a reproduction of a 1960s promotional cut-out Vince Guaraldi mustache that can be worn; and a 16-page booklet, featuring rarely seen photos and Guaraldi ephemera, plus liner notes by jazz historian Doug Ramsey.